Swiss glaciers and the Engadine are an undisputed Alpine highlight. This is where Alpine tourism started its successful career 200 years ago. Even today, the majestic mountains around St. Moritz have today lost none of their fascination - on the contrary! Mountain biking lets you experience nature more intensively than ever before. The route from St. Anton to Lake Como is chock full of mountain bike classics. Assuming you have the stamina to do so, you should have experienced this at least once in your life. We'll have finished the ascent to the Heilbronnerhütte before the lunch break. Riding in high alpine terrain, we'll descend to Galtür and then on to Ischgl. A 4-star hotel with wellness area awaits us. Reaching the 2744 meter high Idjoch demands a great amount of strength and concentration. The reward for our efforts will be a glorious descent on tricky paths into the Inn valley. In Nauders, we’ll stay in another top 4-star bike hotel with all creature comforts. On nice trails, we'll roll down into the Engadine and climb the legendary Pass Costainas. We'll experience lots of highlights demanding a high level of riding technique. In a quaint hotel in Val Müstair, we'll scoot together a little bit in the small sauna. The Val Mora is generally counted as one of the most beautiful mountain bike trails of all. We'll up the ante and ride on the specially built trails at Passo Trela. That way, we'll be above 2000 meters altitude almost all day. Afterwards, we'll relax in a pleasant hotel in the tax haven of Livigno. Today, we'll have a great view of the world of Swiss glaciers. On technical trails, we’ll ride into the heart of the Engadine. Cheesecake tastes especially good at the foot of the famous Morteratsch Glacier. In the afternoon, we'll proceed past St. Moritz and the Engadine lakes to a neat Swiss hotel in Sils. From the beautiful Heidi landscapes, we'll ride down to the climber's paradise of Val Bregaglia. At the foot of the world famous climbing rock, several mountain bike delicacies await us before Italy welcomes us with a cappuccino. Arrival in the mediterranean climate of Lake Como. 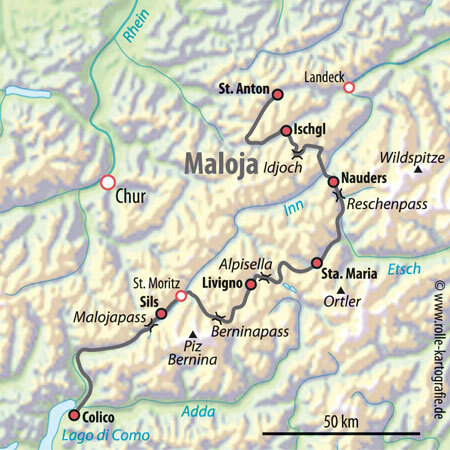 Ben Ewald, ALPS bike guide for the Transalp Maloja and Transalp Riva. Arrival: Arrival by car or by train to St. Anton/ Austria. Type of route: Gravel paths, single tracks, secondary roads. Included in the price: Guided tour with 7 overnight stays and half board (breakfast buffet, multi-course dinner menus) in good 3- or 4-star hotels in a double room, often with wellness areas. Luggage transport, cable car tickets, return transfer in a comfortable bus.